Are Precious Moments figurines worth anything? Their sweet, teardrop eyes and angelic expressions have made Precious Moments figurines beloved collectors’ items for years — and if you have any gathering dust on a shelf, it may be time to take a second look. 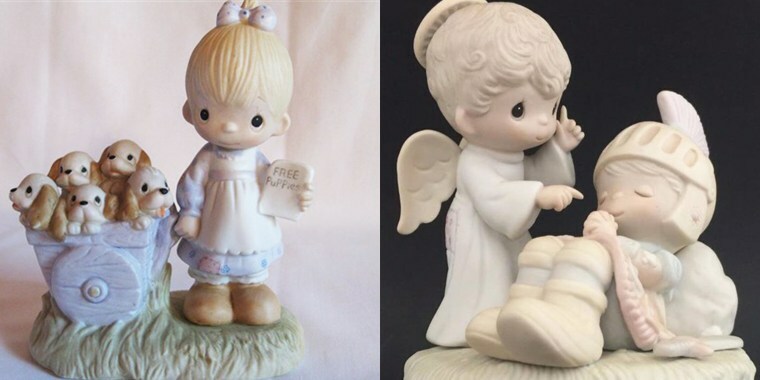 Today, there’s a thriving online market for classic Precious Moments memorabilia, and one figurine in particular could be worth hundreds or even thousands of dollars. It’s a porcelain sculpture called “God Loveth a Cheerful Giver,” and it is one of the original 21 Precious Moments collectibles released in 1979. To get tips and tricks for cleaning, organizing and more right in your inbox, sign up for TODAY's Everyday Solutions newsletter. The cute piece portraying a little girl giving away free puppies originally retailed for $15, but today it can sell on eBay for hundreds of dollars. One recently sold for $188, and another for $250. If you’re very lucky, though, you could potentially fetch a much higher price. The “God Loveth a Cheerful Giver” figurine “has had valuations placed on it … in excess of $2,000,” said Paul Burton, a spokesperson for Woolvey Fine Antiques & Collectibles, which specializes in selling retired and limited-edition figurines. “I don't believe I have seen one actually sell for more than half of that, although they are still occasionally listed for sale in that price range,” he told TODAY Home in an email. Either way, it’s a pretty great return on investment — and it makes this 1979 figurine “probably the most valuable” item in the Precious Moments collection. A few limited-edition Precious Moments collectibles, like this one signed by Precious Moments sculptor Hiko Maeda, can sell for a few hundred dollars on eBay, and other figurines from the peak of the Precious Moments craze, such as this 1981 musical figurine, “Silent Knight,” can still fetch more than $100. They aren't all big sellers, however, since many pieces from that period have very little value now, Burton said. If you're lucky enough to have a “God Loveth a Cheerful Giver” figurine on your shelf, it is more likely to fetch a good price if it’s in excellent condition, as even a small chip or crack can dramatically reduce the item’s worth. Also, before you put post the figurine on eBay or bring it to an antiques dealer, make sure you clean it well, Burton suggested. Use a soft makeup brush to dust the porcelain sculpture and, if needed, wash it gently with mild, soapy water, making sure not to get any water inside. Bottom line: Check your china cabinets — you could be hanging onto a Precious Moments treasure! This article was originally published on Oct. 17, 2017 on Today.